This time last week I fed baby and zoomed off into the black to sit in Waikato University’s lecture theatre to watch a collection of documentaries as a part of the Inspiring Stories tour. Apart from the hot lemon and barley at intermission and the healthy debate about corporations and their partnership with the arts, the highlights of the night for me were 4 films – 3 of which you can view on the Inspiring Stories website. Continuity Error – which won the 2012 Award. A doco about gapfiller. Who are gapfiller you ask? Gap Filler is a creative urban regeneration initiative started in response to the September 4, 2010 Canterbury earthquake, and revised and expanded in light of the more destructive February 22, 2011 quake. 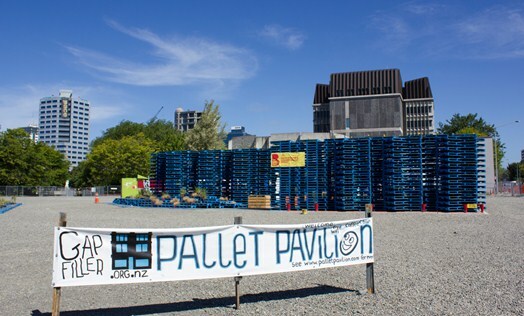 Gap Filler aims to temporarily activate vacant sites within Christchurch with creative projects for community benefit, to make for a more interesting, dynamic and vibrant city. A documentary about a Mum, Dad and their 3 kids who collect cigarette butts from their local beach in North Carolina. In 188 days they collect 55,099 butts. She has a mantra, a blog and this doco – it starts with me. And a real feel good film which is very relevant to me as we begin our journey thinking of our girls’ imaginations and educations – Caine’s Arcade 2. A bit of history? In 2012 alongside Kimberley Cleland I gave pecha kucha presentations (mine about wild & grace) to an eclectic group of young people at an Inspiring Stories workshop, there to learn about ‘how to make film’. This is now Inspiring Stories’ 3rd year of touring Aotearoa offering youth an intensive 1-day programme which covers storytelling, camera, editing, and project development. The film students are then encouraged to make a film and enter the Inspiring Stories film competition. Imagine if every young New Zealander unleashed their potential to change the world. Imagine if the stories of those passionate young leaders could inspire others – peers, communities, nationwide and beyond. Inspiring Stories Trust is a catalyst for action – showcasing what’s possible, sparking ideas, and celebrating young Kiwis making a difference. Since launching in 2011, we’ve supported thousands of young New Zealanders to develop skills and confidence to be the change they want to see in the world. I’ll finish tonight by telling you I’ve just nominated Kimberley Cleland for BeCause (a sub-action of Inspiring Stories). The main reason I nominated Kimberley is because she is a quiet unstoppable energy that encourages a happy, healthy, connected community and environment. I wrote about Kinfolk and Kimberley here. Ellie Ngatai has been nominated from Buller BeCause she wants Aotearoa to be smokefree by 2025. Ben Dowdle (Auckland) BeCause we need mandatory labelling of Palm Oil in New Zealand. Matilda Gaby (Wellington) BeCause I want more people to know about the situation in Burma. Seb Frances (Christchurch) BeCause I want to live in a community where people act in a way that makes others happy. Silvia Zuur (Wellington) BeCause I want to enable the possibility for everyone to say yes. Corey Fuimaono (Porirua) BeCause we need more young people in media and technology. Click here to vote for one of our outstanding young kiwis living to make a difference, to make a better world.